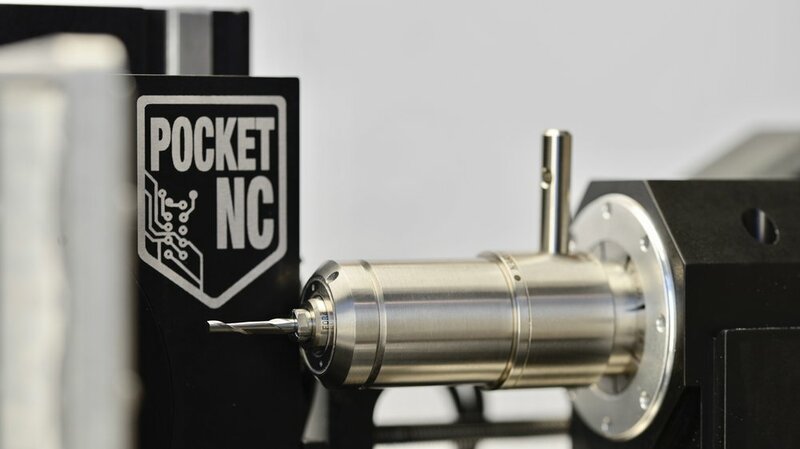 We at Pocket NC are pleased to announce the release of the V2-50, a 5-axis desktop CNC milling machine with a 50,000 RPM spindle and a 2 micron TIR quick change spindle. The V2-50 sports a precision ground Japanese spindle, hybrid ceramic bearings and Swiss electronics to achieve material removal rates unmatched by standard milling equipment. We have also partnered with DATRON, a German manufacturer of world class vertical and horizontal machining centers in an effort to provide tooling that compliments the incredible speed provided by the NSK spindle. At Pocket NC we are all about the world of small: small parts, small tooling and with the V2-50, runtimes can be small as well. Those of you in manufacturing already know material removal rate is critical. To make parts quickly, chip load is key. The faster stock material is removed, the more cost-effective a part becomes. The benefits of increasing the material removal rates do not change for small parts, but the amount of pressure we can apply to small tooling compared to large tooling does change. Spikes in tool pressure, even minor ones, often result in broken tooling and because of this small tools are run at lower feed rates and with less chip load which results in expensive, time-consuming parts. High spindle RPM changes the game. Standard machining centers are usually equipped with spindles operating in the 6K-15K RPM range. While these machines may be much larger and more rigid than the V2, the tooling used to make a small part is no different. A given endmill is only capable of removing so much material per cut. By increasing the spindle speed 5x over the V2-10 and most other milling machines, users can achieve runtimes up to 75% shorter and see a significant improvement in small tooling life. To see all of the above action on the V2-50 check out what Ed Kramer has been up to on the V2-50 machine in his shop over the last couple of months. Anyone who knows Ed knows that he likes to cut hard materials and push his machines to their limits, exactly who we were looking for to find out what this machine could handle. Some of you may recognize this as the spindle we used on our original machines. This is true, however the original Pocket NC just wasn’t ready for the NRR-2651. The motor and electronics on the V1 only allowed the spindle to reach speeds of 10,000 RPM, the V2-50 spindle is accompanied by a motor and electronics that support the 50,000 RPM. Another hurdle for V1 users with the NRR-2651 was that even though the lever offered a quick tool change, tool length measurement was anything but quick. With the addition of the tool probe on the V2, V2-50 users will be able to use the quick change lever to easily swap tools and the tool probe will help to keep the workflow moving. The V2-50 is released for pre-orders which will start shipping in May and June 2019. We are only taking a limited number of pre-orders and will fully release this product in Summer 2019. We will have pre-orders available until we run out! For more information on the V2-50, please see specifications here. Information on upgrades and other FAQ can be found here. We’ve run this spindle through the paces with tougher materials than ever before (G5 titanium!) and we can truly say, we are impressed and think you will be too!